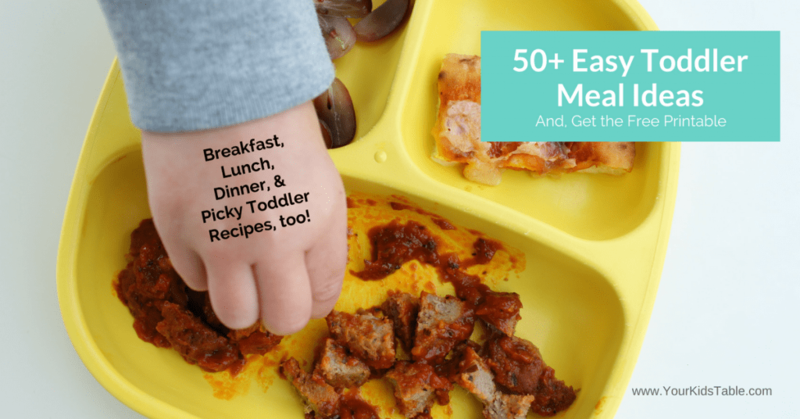 Over 50 easy toddler meals and food ideas for breakfast, lunch, and dinner. Plus, special hand picked recipes for picky toddlers and a free printable. It’s so easy to fall into a rut of feeding our kids the same things over and over again, especially toddlers, because they can be picky (that’s normal) and there’s often little time to actually prepare their food. But it can be done, simply, with this huge list of quick and easy toddler meals, that also happen to be healthy. Besides the dozens of toddlers I’ve worked with as an OT, I’m also on the third toddler of my own. I get it, and I’m in the trenches with you! So, you need some inspiration? 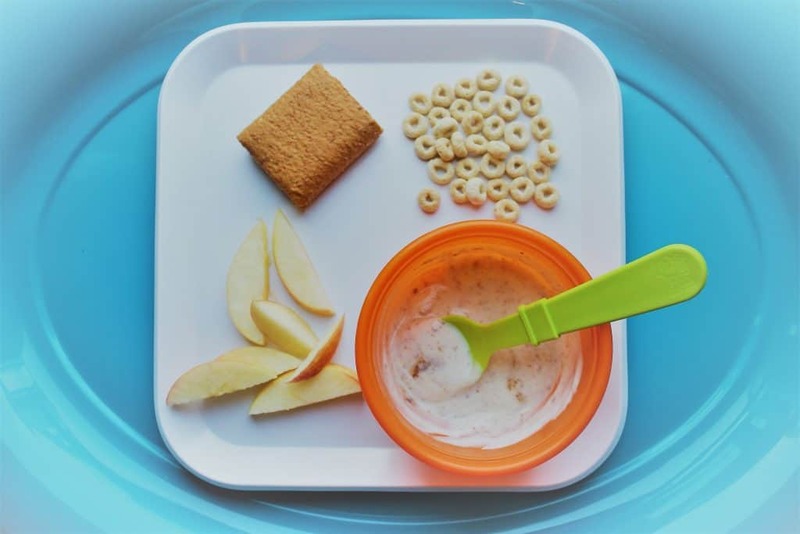 Below you will find breakfast, lunch, and dinner toddler meals, as well as special recipes for picky eaters and my favorite toddler plates, cups, and forks/spoons. And, because it’s A LOT of ideas, I have a special brand new printable that includes all of these toddler food ideas and more! Yup, you can print this out and hang it on your fridge. You’ll be able to get it at the end of the post. 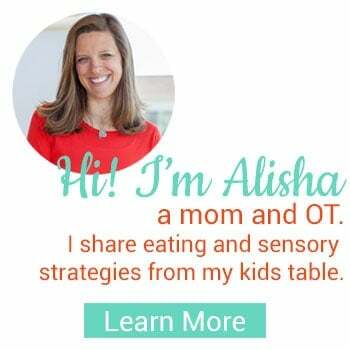 If your toddler is still in the process of learning how to eat real table foods and move away from baby food, you’ll want to check out: How to Transition to Table Foods first. 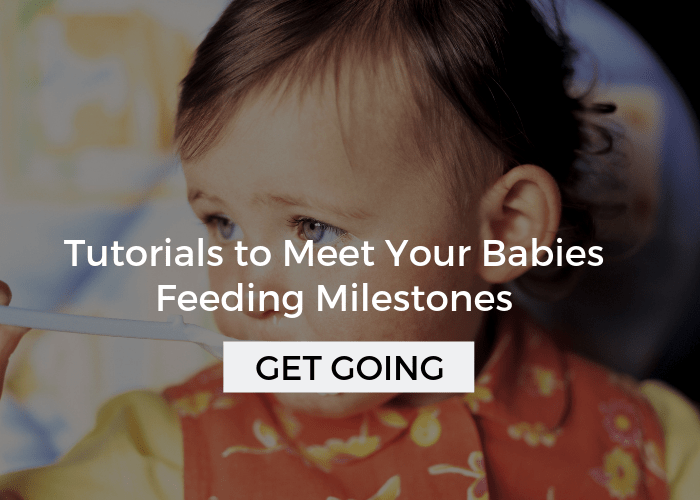 This list is aimed at 1.5 – 2 year olds and up. 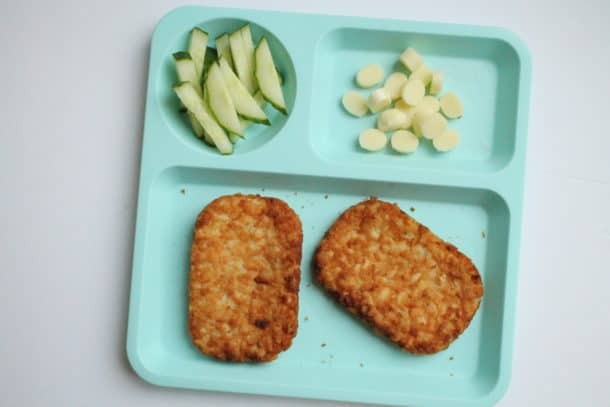 Although younger children can eat many of these meals, too. If you’re looking for specific ideas for babies in the range of 8 to 15 months, check out Baby Finger Food Ideas and Baby Meal Ideas. You’ll see a lot of different ideas here, and in the pics, you’ll notice I haven’t cut the food up as small. Many of these foods are finger foods, but some require being able to use a fork or spoon. I look for toddlers to be able to feed themselves by age 2. Click How to Teach Self Feeding to get my special tricks to get the job done. 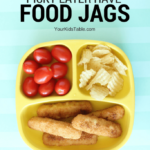 And check out more finger foods for toddler ideas here. I like to serve milk with all meals, and at meals only from a straw. You can learn two different fast ways to Teach Your Toddler to Drink From a Straw. And, if your trying to wean, find my complete guides on How to Wean from the Bottle and How to Stop Breastfeeding. Until 4-5 years of age, toddlers still need all choking hazards cut into small pieces, that means grapes, hot dogs, and sausage, in particular. In a few of the meals below, I mention dips, they can be incredibly motivating for kids, especially toddlers. 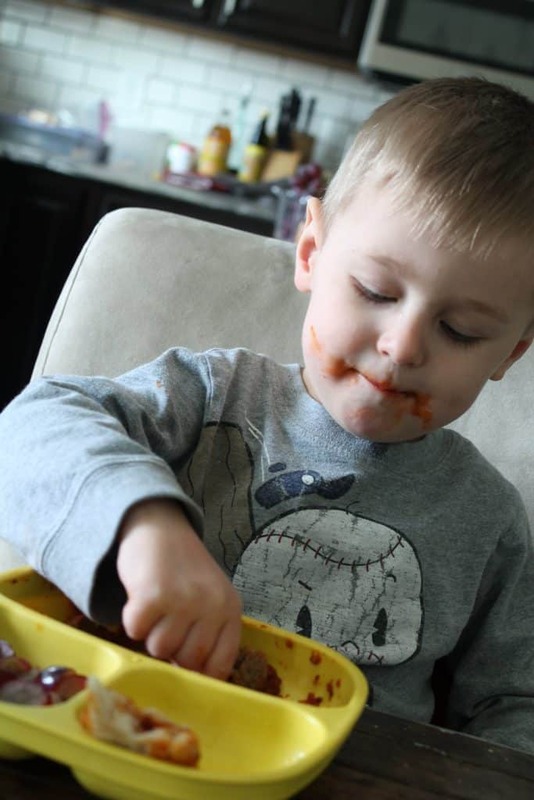 Don’t hesitate to add a dip with any meal and read about how to use dips with toddlers here. My youngest eats a lot of the foods on this list, but not all of them necessarily. That doesn’t stop me from serving them. I always make sure there is at least one thing I’m nearly certain he will eat. Your toddler may just surprise you, my James (that’s the 2 year old) loves falafel, and will eat it with some heat, no problem. I never would’ve known that if I hadn’t given him the chance to try during one of our family meals! 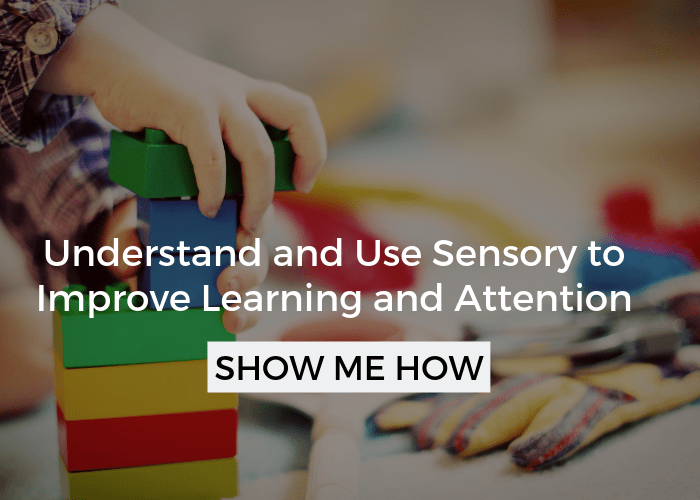 It’s normal for toddlers to throw their food sometimes, but it can be super annoying. 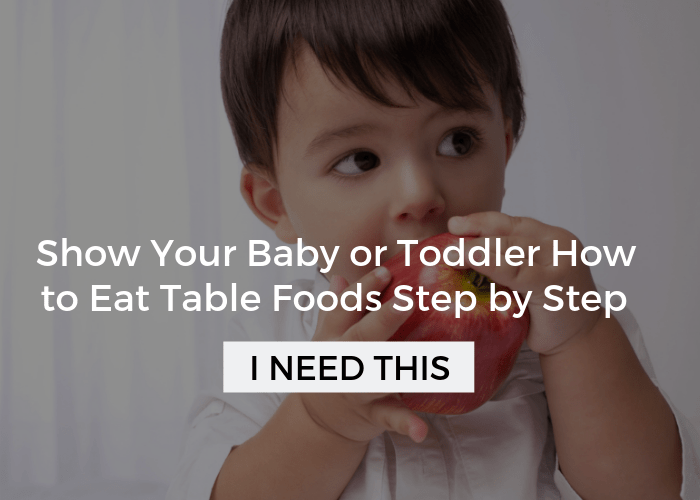 If you need some strategies to end the daily food fight, head to Stopping a Toddler Throwing Food. As you scroll through the many toddler food ideas below, keep in mind that there are a few guiding principles I use with every single meal I serve. First, each meal has at least one protein, one fruit or vegetable, and one carbohydrate. I also try to offer 3-5 foods and give small portions, I can always get them more. Click here for recommended Portion Sizes for Toddlers. I also stick to a schedule of sorts and have a couple of rules, yes, even for a toddler. 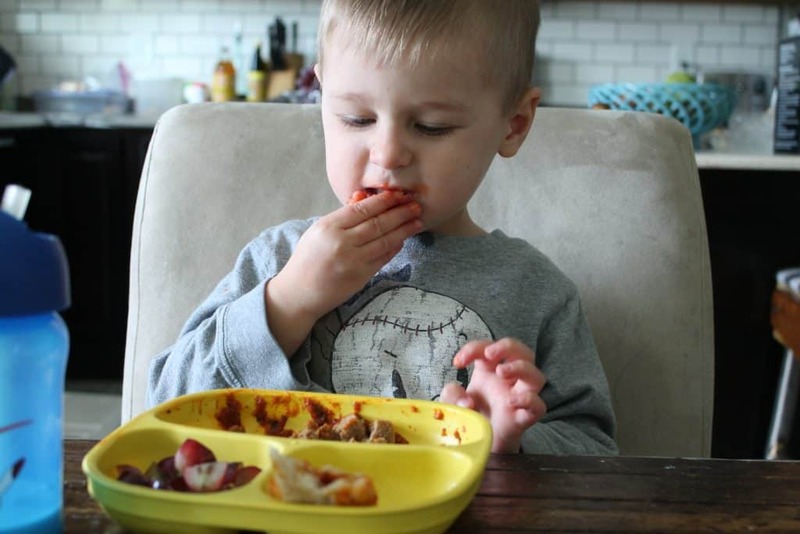 You can read more about those in How to Prevent Picky Eating in toddlers. Toddlers can be exhausting, but they are so freakin’ cute. 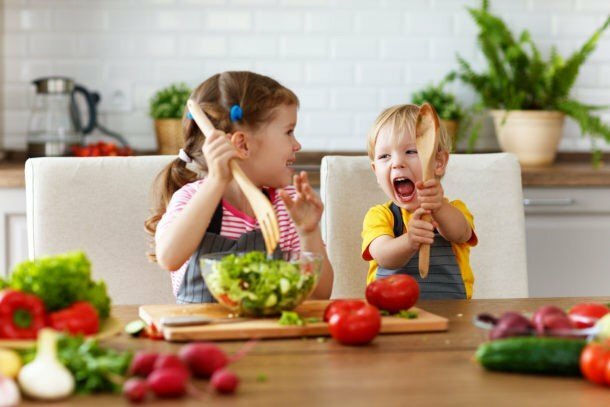 Remember to have fun at meals, and don’t worry about the mess, because getting messy is actually good for their development and also heads off picky eating, click that link to learn more about why. I’ve organized all these toddler meals into categories to make it easy, but don’t hesitate to mix up. There’s nothing wrong with having french toast for dinner, and use as many dinner leftovers as you can for lunches. Oh, and you may notice the plates, utensils, and cups I’m using. You can find where to get them at the end! *Want more inspiration? Check out more at toddler breakfast ideas. 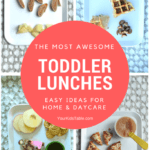 *If you’re looking for even more, including ideas for daycare, head over to toddler lunch ideas! Any of the toddler food ideas that are already in this list can also be used for picky eaters, but since soooo many toddlers are picky, I hand picked a couple of recipes that can be really helpful. Also, if you’re new here, you may not know that I’ve written A LOT about picky eating. 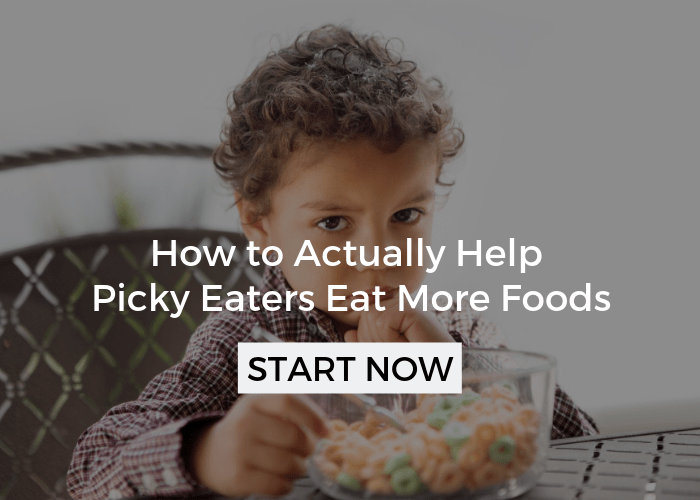 If you want to get some tips to turn the ship around, or at least keep it from getting worse, check out My Best Strategy for Picky Eating and How to Get Your Child to Explore New Foods. Vegetables, in general, are often rejected by toddlers in general, and especially by picky eaters. Of course, I have you covered. You can get tons of ideas over at my Mega List of Vegetable Recipes. 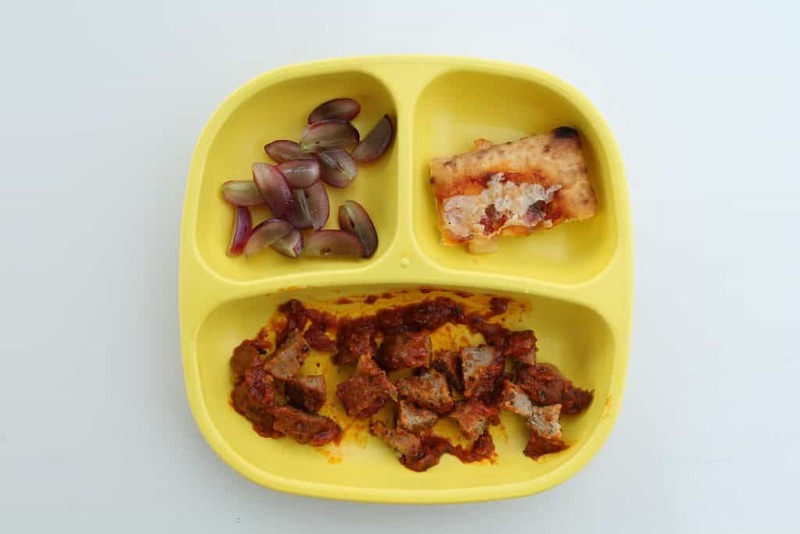 My favorite toddler plate because its super durable and has three sections, which is so helpful for toddlers. It’s also deep enough that you can put soup or rice in one of the sections. You can get the toddler plate here. My favorite toddler straw cup because it is easy to clean, period. Straw cups are so good for toddlers, but they can be a pain, this one isn’t. Plus it’s really affordable. Find the best toddler cup here. My favorite toddler fork because it actually stabs the food but isn’t sharp enough to hurt them. It also has a nice thick handle that makes it easy to get food. Get the best toddler fork here. My favorite toddler spoon because it is bent at an angle that helps them actually get the food into their mouth and has a nice deep bowl. And, bonus, it also comes with a spork! All of my kids have used these same forks and spoons. Get the toddler spoon set here. My favorite “alternate utensil”, seen in the picture above, are these safe toothpicks that are incredibly motivating and fun for kids. You can get these safe toothpicks here and read why using a stick to eat can make a game changing tip for picky eaters. There you have it, that’s over 50 meal ideas in total, and some extra tips. Was this helpful? What are you inspired to try? Tell me in the comments below! 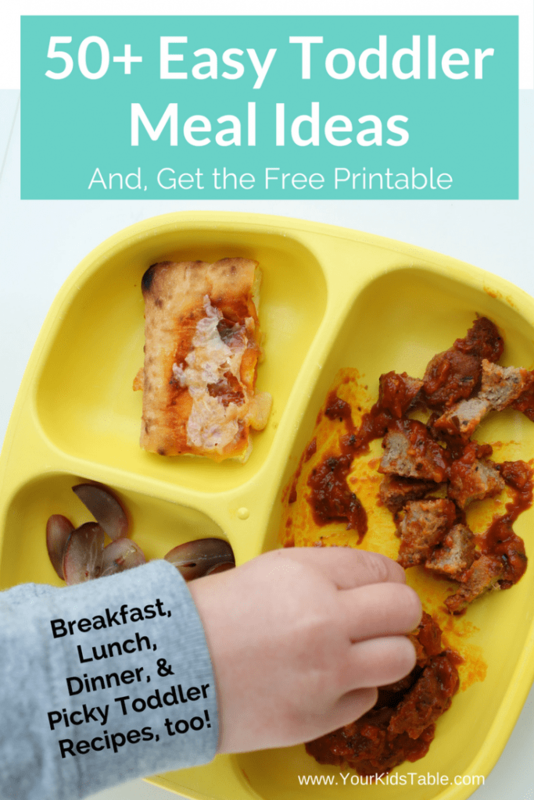 The Free Toddler Meals Printable!!! 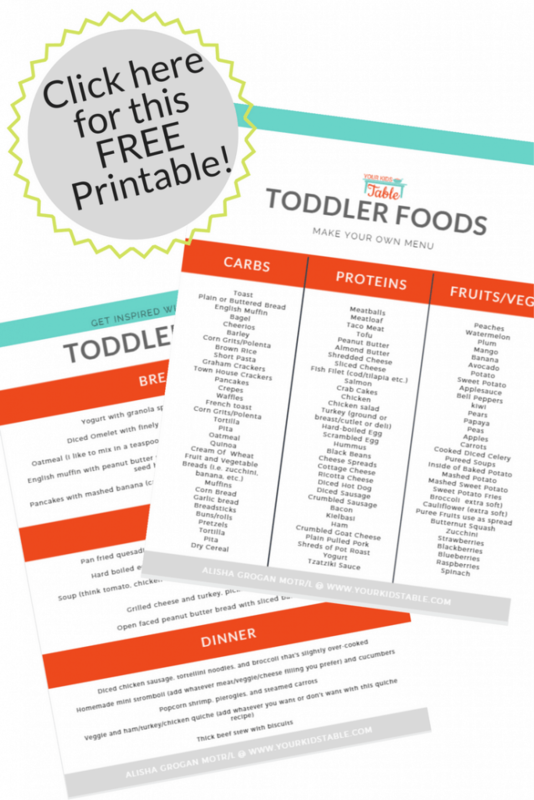 Oh, and about that free printable… So, if you want to have a bunch of these toddler food ideas and meals in a handy doc that you can save or print out for your fridge, then grab this free printable! Get it right here. If you’re still looking for more ideas follow along on Pinterest and keep the inspiration coming. 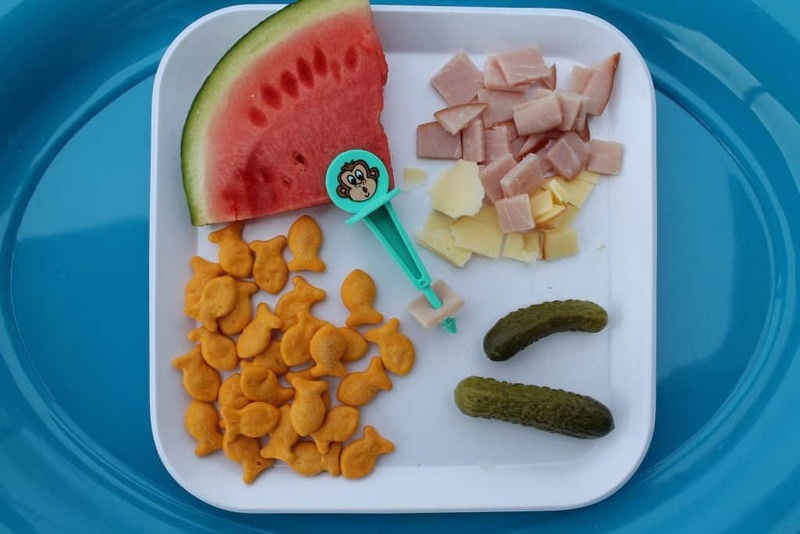 I literally pin food ideas and tips for toddlers every single day! There are so many ideas packed in, you may want to check this out again! Click the Pinterest button in red to save. Thanks for the amazing post btw! The most important thing is that you space meals 2.5-3 hours apart! Check out this schedule, its still applicable for kids up to 2 and beyond. This is a really great list!! However, you mention apple slices and carrot sticks. I’ve been afraid to give my 17 month old these things as I’m nervous she will choke. Do you think that she’s old enough to try these? Also, besides the few things you mentioned at the beginning of this post, do you still cut a lot of the food up? I still cut a lot of my daughters food up. However I’m trying to leave sandwiches in bigger squares so that she can pick up and take bites. I always struggled with the timeline of stuff like this. Any advice would be great! What I like about this list the most – is that most of it requires little to no actual cooking time, which is ideal for my daily routine that only allows for 15 to 20 minutes to put dinner (lunch, breakfast, snack) on the table. My 19 month old is a good eater, but only likes mushy foods with sauce etc. Not purees as the foods she has do have bits of chicken, veg such as peas and carrots etc but she only like it all mushed together and doesn’t like dry foods! How can I get her to start enjoying foods that do not have a such a saucy consistency, such as sandwiches and pizza etc?